If A is an event within the sample space S of an experiment, the complement of A (which may be written as AC) consists of all outcomes in S that are not in A. The complement of A is everything else in the problem that is NOT in A. Event A The coin shows heads. Complement AC The coin shows tails. The cards in a standard deck are either red or black. The probability of the complement of an event is one minus the probability of the event. 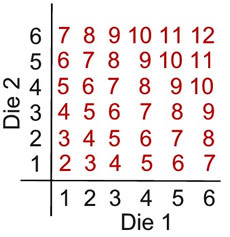 Since the sum of probabilities of all possible events equals 1, the probability that event A will not occur is equal to 1 minus the probability that event A will occur. A pair of dice are rolled. What is the probability of not rolling doubles? There are 6 ways to roll doubles: (1,1), (2,2), (3,3), (4,4), (5,5) (6,6). A pair of dice are rolled. What is the probability of rolling 10 or less? The complement of rolling "10 or less" is rolling 11 or 12.
e.) red, white, or blue? f.) not a color in the flag of the USA? 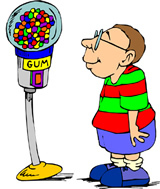 There are 120 gum balls in total in the machine. a.) the probability of green is 20/120 = 1/6. b.) the probability of not green is 1 - 1/6 = 5/6. c.) the probability of not orange is 1 - P(orange) = 1 - 5/120 = 1 - 1/24 = 23/24. d.) the probability of orange is 1/24. e.) the probability of red, white or blue is 36/120 + 44/120 + 15/120 = 95/120 = 19/24. f.) find the complement of part e: 1 - 19/24 = 5/24.